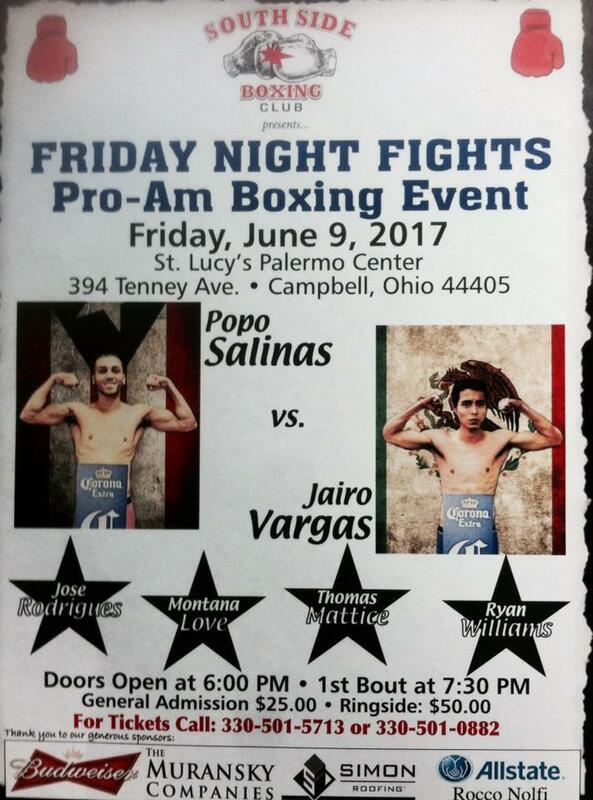 Jack Loew has been busy the past couple weeks doubling up as a promoter and a trainer as his South Side Boxing Club will be presenting Friday Night Fights at the Palermo Center in Campbell this upcoming Friday, June 9. 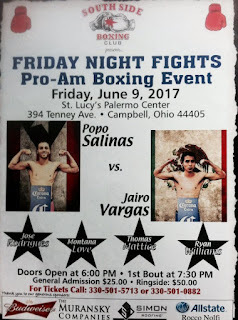 Four pro bouts will highlight the Pro-Am card which will feature the top prospect in the city of Youngstown, Alejandro "Popo" Salinas talking on Jairo Fernandez Vargas (6-2, 5 KOs) of Mechanicsville, Virginia who is rumored to be very confident heading into the scheduled eight-round main event. Vargas, 29, who lost his last bout by a unanimous decision to Pittsburgh native Bill Hutchinson back in November will be seeking his first victory since a knockout victory over Tony Wilson in October. Unlike Vargas who has gone 2-2 in his last four bouts, Salinas, 22, who is trained by Loew will bring the confidence of a four-fight win streak into the ring this upcoming Friday as the junior lightweight prospect currently boasts a pro record of 7-1 with all seven victories coming by way of knockout. A handful of fighters from the South Side Boxing Club stable will be featured on the amateur portion of the card that will be featuring Ryan Williams. Williams, who coaches wrestling at Liberty High School started boxing at South Side Boxing Club with trainer Vincent O'Neill as a way to get himself back into shape. Williams has now gone from boxing for fitness purposes to a crowd favorite prepping for his second amateur bout. Also slated to be representing South Side Boxing Club is Jackson Behun, Jacorian Dent, and Nate Dykes. Stay tuned to youngstownboxingnews.com all week long as we will have updates and features on the fight card.